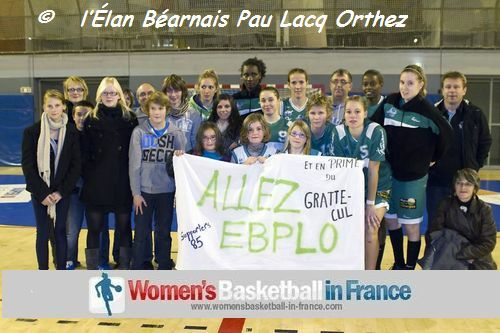 The most difficult regular season in LF2 basketball came to an end with Pau-Lacq-Orthez picking up the last ticket for the Final Four in Nice. Before the season started Cavigal Nice and COB Calais were picked as clear favourites to finish in the top two positions at the end of the regular season. They did not disappoint and occupy the first two places. The battle for the remaining two places was contested by Léon Trégor, Roche Vendée and the recently promoted duo teams Angers and Pau-Lacq-Orthez. In the end the clubs that played in NF1 last season (2011-12) had more balanced team rosters, that enabled them to overcome any player's issue. So the two best teams from NF1 in 2012 will contest for the title of 2013 LF2 Champions of France. COB Calais ended Léon Trégor's dream of playing in the Final Four with another display of clinical finishing (85-56). Calais, led by Mélanie Arnaud (19 points, 10 rebounds) and Floriane Herrscher (17 points) blitzed their opponents 45-22 during the second and third quarter. Oumou Toure in her last game for Léon Trégor scored 20 points and pulled downed 13 rebounds. She will be playing in the LFB next season with USO Mondeville. Pau-Lacq-Orthez had to win this weekend first and then hope on a defeat for Léon Trégor to qualify for the LF2 Final Four. Reims had no answer for Laurie Lapeyre from Pau who went 9-of-10 from the floor in scoring 19 points to lead her side to victory (68-52). This result ended the dream for Manu Body and Roche Vendée of sneaking into the end-of-season final. In the two remaining games nothing was at stake. Angers visited Limoges and walked away with a comfortable victory (84-68) while the CFBB brought their season to a perfect end with a strong performance in beating Illkirch-Graffenstaden (70-45).